We have some great things to share with all of our partners, and more to come later! Here is a quick update on the new customer-recommended product enhancements. 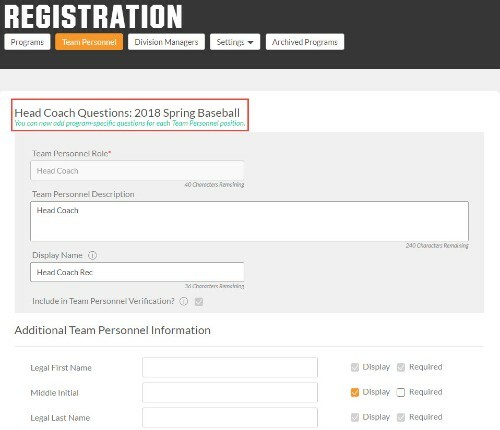 Need different program-level registration questions for your Team Personnel roles? Whether it’s a Recreational versus Competitive Head Coach, a soccer versus a baseball Assistant Coach, or other team personnel roles, you’ll want to target each role with the accurate questions. Another customer-recommended enhancement, our program-level team personnel questions allows you to ask different questions, by program, for the same volunteer role. Our standard team personnel roles (Head Coach, Assistant Coach, & Team Manager) can be displayed for any registration program. In short, when a single role is made available across different programs, an admin can ask a different set of questions specific to that program rather than creating a duplicate, custom role. Admins can edit team personnel questions by either selecting the ‘Team Personnel’ option from the Registration tab and navigating to the desired role, or from Step 4 in the Registration Setup Wizard, where you can edit the team personnel questions. Organizations that schedule games during the week need to limit how many weeknight games can be played. When using our fully-automated (pairing with date, time, & field) game scheduler, you can ensure your teams play as little or as many games per week as needed. The Total number of Games a Team Plays Per Week option will schedule each team that exact number of games per week – until they run out of games and teams to play. Total number of Games Per Week overrides the Max number of Games Per Day criteria. For example: if an admin were to set up a schedule with 3 Total Games Per Week and 1 Max Game Per Day, but only Tuesdays and Thursdays are the available game days, then the system will override the 1 Max Game Per Day on one of those days to ensure the 3 Total Games Per Week criteria is fulfilled. As youth sports change and progress, so does our technology. We listen to all of our customers, no matter how big or small. If you have any suggestions for product enhancements, or new features, your voice will be heard and we will try our best to make it happen. Just submit your idea here.